Great-selling, interesting and unique games that bring people together is what makes We R FUN games, well - FUN! 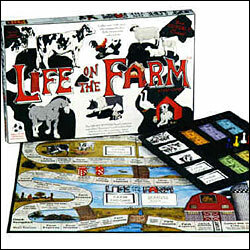 Life on the Farm board game was awarded the Grand Prize 'Award of Excellence' and acclaimed as the "Best Game Reviewed" by educationexplorations.com. Other acheivements are ...**Winner** of 2004 "Outstanding Product" - iParenting Media Award - Listed in "Best Products for 2004" - Also was the **Winner** of 2004 "Hot Product" - iParenting Media Award - Listed in "Hottest New Toys for 2004"
Life on the Farm lets you experience what life is like on an American family farm! Fast 'moo'-ving action and real family farm mishaps combine for 'udder'-ly unpredictable family fun. Buy more cows to get bigger milkchecks, but that also means higher expenses! 1st to "Retire" wins! FUN for ages 8 to 108. **NEW** Preschool Edition of "Life on the Farm." 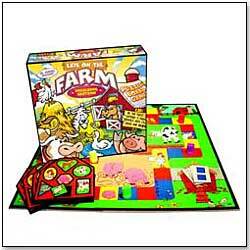 Designed for ages 3-7, the soft non-toxic foam play-mat (for floor play) is also a large 5-piece puzzle. When assembled, the playmat becomes the gameboard. Fill your barn with animals to win! This game quickly became a favorite when tested by early education specialists. We R Fun also presents Minus 13, an intriguing new math game in a triangle box that draws a lot of customer attention! Minus 13 has an unique hexagon game board, designed from six stepped triangles. Shake dice to collect chips, roll again to determine value. This is a FUN new way to hone basic addition, subtraction and multiplication skills. Click here to see some of the newer products WE R FUN has shared with ToyDirectory and TDmonthly Magazine.